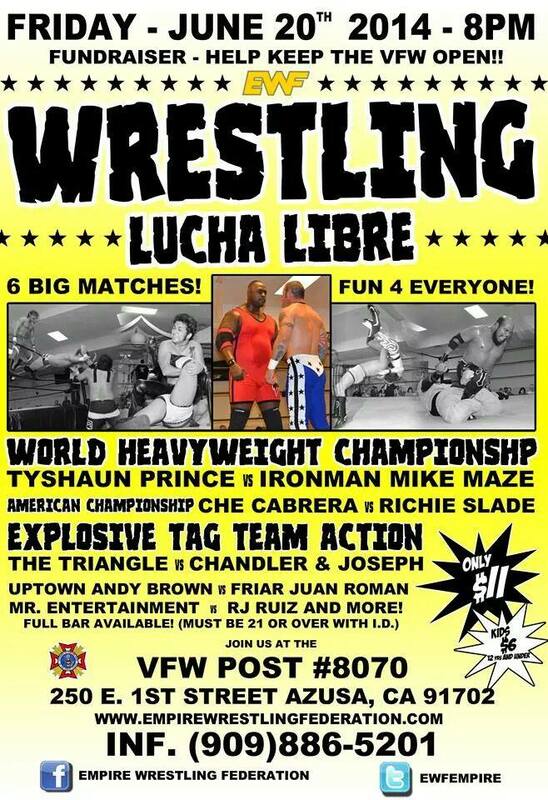 This is Mike Draven with a recap of the Empire Wrestling Federation event at the VFW in Azusa, ca on Friday, June 20th. This event I viewed through Livestream.com. “Mr. Entertainment” Joey Barone def “The Overnight Celebrity” R.J. Ruiz with a Cutter finisher & some help from Brute Baretto. Afterwards, Ben Tomas asked about the dog coller he brought to ringside & we learned that next weeks event in City of Industry will be a Dog Collar Match with Brute Baretto vs RJ Ruiz. Kensho def The Viking Warrior via Dragon Sleeper submission. Viking Warrior was pretty much upset since he loss to a “Blind Man”. As we get ready for the next match, RJ Ruiz joins Matt Sinister joins the commentary team as Walt Zeman is no longer there. “Sunset Blvd Bad Boy” Richie Slade def Che Cabrera with his “Standing Stage Dive” finisher to retain the Championship. Footloose (Dan Joseph & Todd Chandler) def Triangle of Terror (Prince Raccid Najjar & Ukleja & Abu the Terrible) with a Double team finisher on Najjar. Friar Juan Roman def “Uptown” Andy Brown when the ref was putting Roman’s holy water away, Roman spatted water into Andy Brown’s face & rolled him up for the pin. Tyshaun Prince (w/Walt “Wizeone” Zeman) & “Ironman” Mike Maze were both DQ’d due to pushing the ref. The entire locker room came out to separate both men as this battle continues. Deputy Commissioner Johnny Star announces at July 11th event in Covina, Ca Mike Maze & Tyshaun Prince will face each other in a Light’s Out Match with Walt Zimmerman chained to the ring post. Until next time, this is Mike Draven…signing off.